A couple months ago I was invited to be a part of a new fun group of Wisconsin-based food bloggers. Boy, has my foodie life changed since that day. For as long as I can remember, I have always had a nice rotation of 5 or 6 food blogs I read regularly. They inspire me. They motivate me. They make me excited about things like the changing of the seasons and eating more cake. I love all my blogging ladies, but there was something lacking in this one-sided relationship. Oh yes. A real relationship. Where we like meet and talk and bounce ideas of each other. I was missing that. Then came Wisconsin Whisk and a happy hour where I get to mingle and learn and dream up fun ideas with 15 other food bloggers! Now I have dozens of blogs to read while I run on the treadmill. Plus, being from Madison, many of these new food blogger friends of mine are members of CSAs and focus on local food! My vegetable creativity is sky-high. But not only do I get to read about other people’s Wisconsin lives and all the yummy seasonal produce they’re cooking up, I also get to participate in super fun games like All Whisked Up with my new blogger friends. It’s kind of like the blogger equivalent of Secret Santa. We draw a blog. We read the blog, get to know the blogger a little better and play around with their recipes. All in secret of course. Until the big reveal (hint: that’s today). Meet Sarah of Food Fun & Life in Waukesha. Sarah is super enthusiastic about life and blogging. She’s been doing it for 5 years! When she’s not eating wings with her guy, trying out new wine shops or just generally exploring her hometown of Waukesha, Sarah cooks up some pretty yummy things. And many of these fun eats are focused around Packer game days. I’m not complaining. Do we all know my fall life revolves around the Packers? Maybe we met too late in the season and too close to that heart-breaking loss for you to really understand my passion, but I’m a farm girl who loves football. Sarah shares my sentiment. She also loves to throw parties. So much party food on this blog. It’s awesome! Any how, when I got to exploring her blog, I focused on her October posts each year because let’s face it, we’re well into fall and I’m totally unprepared. Farm-wise, we are right on track as far as fall is concerned. But in my real life (you know the one where I’m supposed to be cooking a dozen pumpkin treats a week and decorating my home with adorable fall leaves), I’m miles behind. 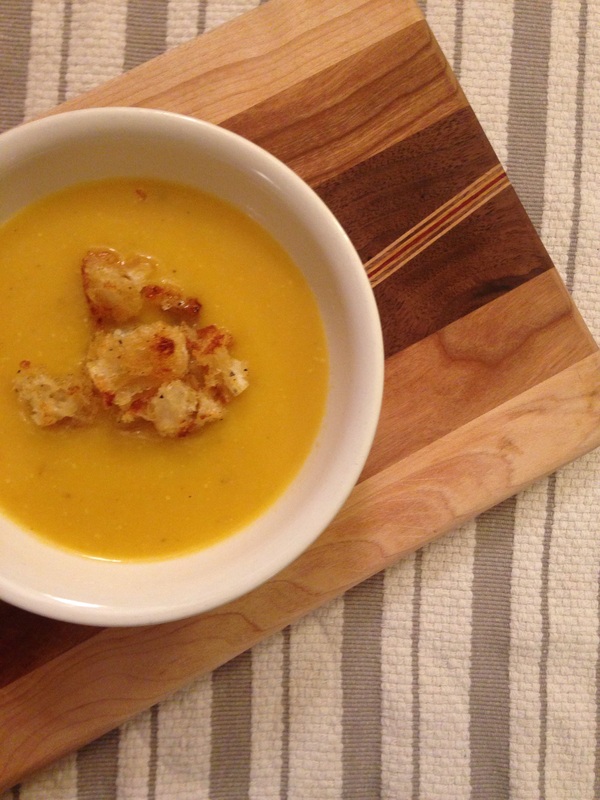 I found this butternut squash and apple soup Sarah made way back in 2012 based off of this recipe. I had to indulge. I left the leeks in (because I have 13 leeks in my fridge right now– I’m not joking), but stayed pretty trure to the recipe. On top, I added crumbled chorizo and croutons toasted in chorizo oil. I love me some spice and crunch with my sweet, velvety soup. I hope you enjoy! Happy Friday! There is a difference between Spanish and Mexican chorizo. Mexican chorizo is fresh and ground. It needs to be cooked before use. It is delicious, but not what you are looking for here. What you want here is cured Spanish chorizo. I get mine from Underground Butcher on Willy St, and you guys, I just adore it. I buy it in enormous quantities. Honestly, I’ve been putting it all over everything I eat. Melt butter in a stock pot over medium-low heat. Add onion and leek with a bit of salt and pepper. Saute until soft and fragrant, about 10 minutes. 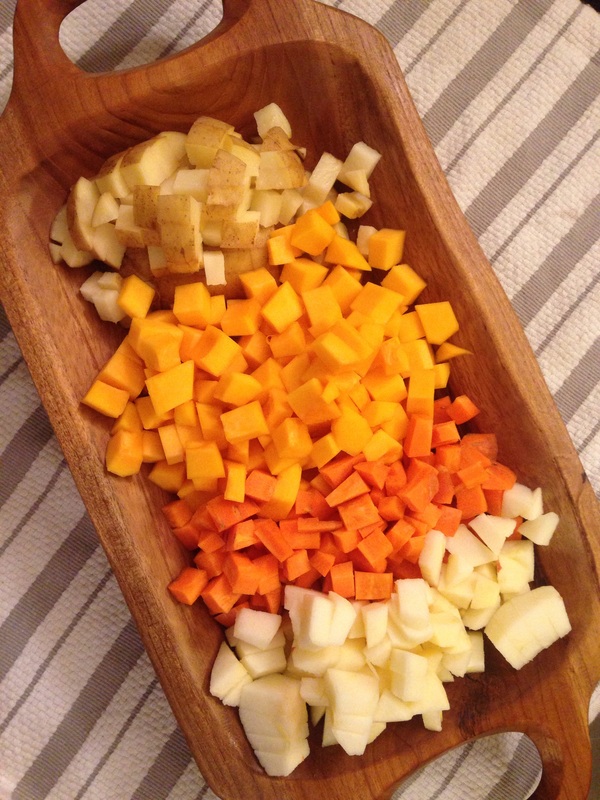 Add squash, carrots, potato, apple and stock. Bring mixture to a boil, reduce to a simmer and cook uncovered for 20 minutes. Remove from heat and puree until smooth. Add wine, milk, nutmeg and a bit more salt and pepper. Simmer over low heat for 10 minutes or until soup reaches desired consistency. Taste and adjust seasonings. Heat olive oil in a small saute pan over medium heat. Toss in chorizo and cook for 5 minutes until just softened. Remove from pan and dice finely. Add baguette pieces to pan and toast for 10 minutes in chorizo oil. Toss often so they are evenly browned on all sides. Add a bit of salt and pepper as you go. 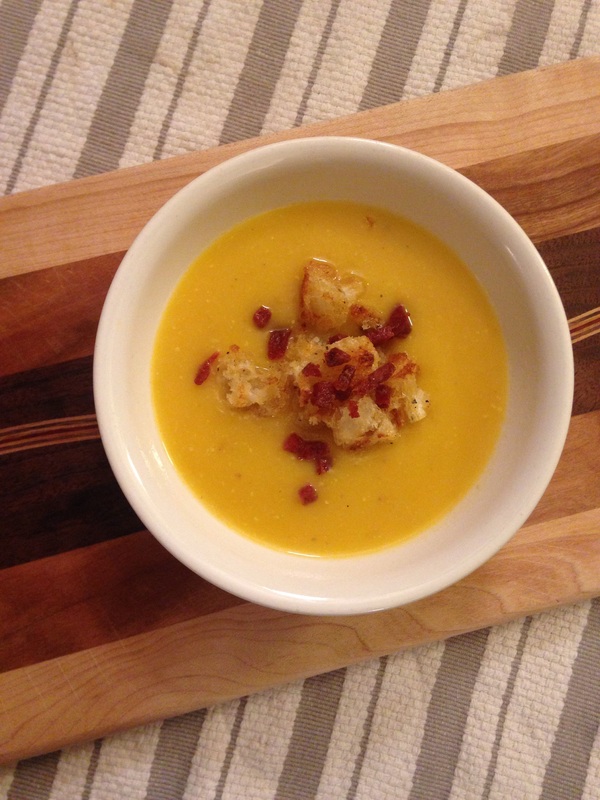 Serve soup warm topped with croutons and chorizo bits. I happen to be throwing a fall happy hour for my non-profit next week. I was going to do a fancy cheese spread. Guess I know one more thing that I’ll be adding to the menu! Thanks for sharing! Great job, this soup looks and sounds delicious!! I read your post and thought the EXACT SAME THING. The chorizo thing is just strange. But clearly fate.